The Postal Service is pushing new developments to use cluster boxes instead of home delivery. It's sending letters, like this one to the township of Cranberry, Pennsylvania, where residents are up in arms against the boxes. If you're moving to a newly built house, say goodbye to mail delivery at your door. And if some House Republicans get their way, all door-to-door mail delivery will go away. The U.S. Postal Service is marching towards a more "centralized delivery," where residents pick up their own mail from clusters of mail boxes located in their neighborhood. Local postmasters are sending hundreds of letters to fast-growing communities, warning that cluster boxes will be the way mail will be delivered to new developments. In the past year, the cash-strapped Postal Service has been asking companies in industrial parks and shopping malls to also adopt this form of mail delivery. But Rep. Darrell Issa, the California Republican leading the House effort to save the postal service, wants more. He has made doing away with doorstep delivery a key part of his bill, which would require everyone to get mail at a curbside box or from a cluster box. 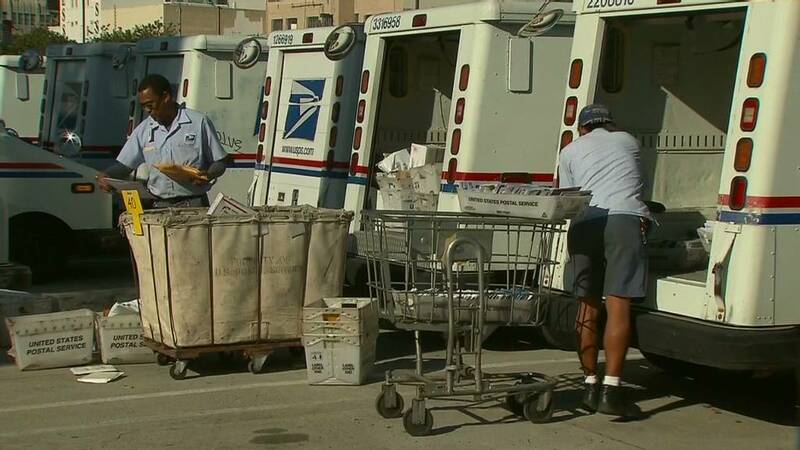 "A balanced approach to saving the Postal Service means allowing USPS to adapt to America's changing use of mail," said Issa, who is chairman of the House Oversight and Government Reform Committee. Moving away from door-to-door delivery saves a lot of money. Right now, 35 million residences and businesses get mail delivered to their doorstep. It costs $353 per stop for a delivery in most American cities, taking into account such things as salaries and cost of transport. By contrast, curbside mail box delivery costs $224, while cluster boxes cost $160, according to a report from the Postal Service's Office of Inspector General. Delivering mail is the agency's largest fixed cost -- $30 billion. Ending such door deliveries would save $4.5 billion a year. That's more than the $3 billion it would have saved from ending Saturday mail service, according to government reports. That's why ending door delivery has drawn industry support from groups like the Greeting Card Association, which supports Saturday service. But unions say it's a bad idea to end delivery to doorsteps and will be disruptive for the elderly and disabled. "It's madness," said Jim Sauber, chief of staff for the National Association of Letter Carriers. "The idea that somebody is going to walk down to their mailbox in Buffalo, New York, in the winter snow to get their mail is just crazy." Yet postal officials say everything's on the table, when it comes to cost-cutting. Earlier this year, it tried to end Saturday mail delivery, but later reversed its decision. The Postal Service continues to struggle with mail volume, especially drops in first-class mail, its big revenue driver, as more Americans move to electronic billing and e-mailing. In 2012, the agency lost $16 billion. Last year, the agency twice defaulted on payments owed to the federal government to prefund retiree health care benefits totaling $11 billion. The agency has also exhausted a $15 billion line of credit from the U.S. Treasury. Ending a Congressional mandate to make large annual payments toward retiree health care benefits would help solve the agency's woes. As it awaits for help from Congress, the postal agency has been trying to do what it can on its own. One of the initiatives is pushing cluster boxes on new developments. "Prior to this spring, we'd work with the construction companies and they could decide if the houses would get cluster boxes or curbline delivery --- now the Postal Service makes that decision," said Postal Service spokeswoman Sue Brennan. 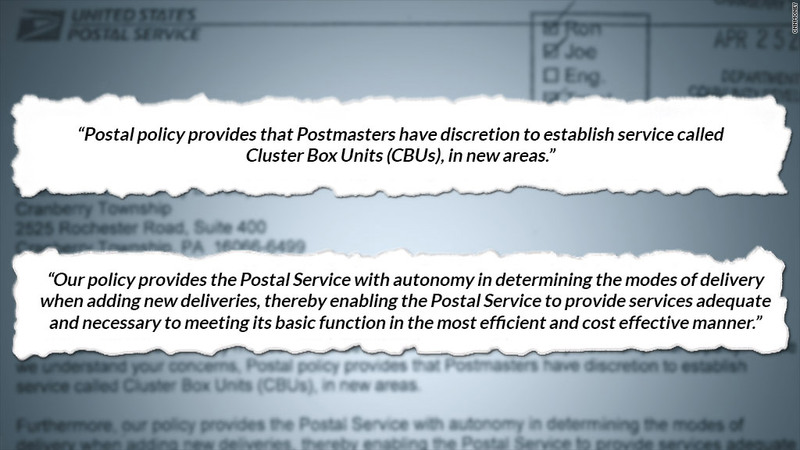 In Cranberry, Pa., the community is up in arms after getting a letter in April from the Postal Service saying cluster boxes would be going in new developments. Community leaders say they understand the boxes are cheaper but they want a better plan that takes into account safety, access and maintenance. Township leaders and the postal service are holding talks over the boxes. "We understand what's driving this is a cost savings," said Cranberry Township Manager Jerry Andree. "But you can't just take a cluster box and drop it into the community without planning for its safety, use and access." For now, residents already receiving door delivery will see no change, unless the route is deemed dangerous because a dog bites a mailman or Congress changes the law, said Steven Hutkins, a professor of literature at New York University, and a postal service expert. "The big thing will be if they get approval in legislation to make the switch for existing door delivery customers," said Hutkins, who writes the blog Save the Post Office.